Ugo Bardini, Paris; sold 1925 to (Thomas Agnew & Sons, Ltd., London); sold 1925 to (Arthur J. Sulley & Co., London). Otto H. Kahn [1867-1934, Mogmar Art Foundation], New York, by 1927; (Duveen Brothers, Inc., London and New York); purchased 26 April 1937 by The A.W. Mellon Educational and Charitable Trust, Pittsburgh; gift 1937 to NGA. Ugo Bardini was the son of the dealer Stefano Bardini, Florence (1836-1922); it is possible that the painting had been owned by the father. The painting is listed in Agnew's stock book, no. 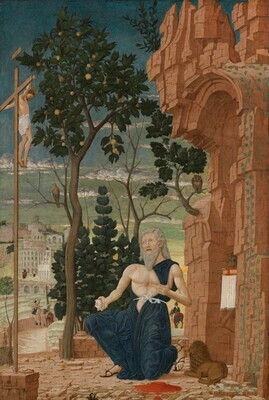 6494, as "Mantegna, St. Jerome," no dimensions, with seller and purchaser (reference provided by the Getty Provenance Index). Alfred M. Frankfurter, "Paintings by Andrea Mantegna in America," The Antiquarian 13, no. 4 (November 1929): 88, states that the painting "came to America from a moderately well known English collection." Kahn is identified as the owner in the following: Lionello Venturi, "Un opera inedita di Andrea Mantegna," L'Arte 30 (1927): 32; Alfred M. Frankfurter, "Paintings by Andrea Mantegna in America," Antiquarian 13, no. 4 (November 1929): 33; Lionello Venturi, Pitture italiane in America, Milan, 1931: 9, and English ed., New York, 1933: 31; Bernard Berenson, Italian Pictures of the Renaissance, Oxford, 1932: 328, and Italian ed., Milan, 1936: 291); Roberto Longhi, "Risarcimento di un Mantegna," Pan II, no. 3 (March 1934): 512; Hans Tietze, Meisterwerke europäischer Malerei in Amerika, Vienna, 1935: 327, and English ed., 1939: 311. The Duveen prospectus states that the painting, then said to be by Mantegna, was "discovered in an English private collection in 1927, when it was acquired by...Kahn...in whose collection it remained until 1936" (copy in NGA curatorial files). However, letters in the Duveen Brothers Records indicate the painting was not purchased from the Mogmar Art Foundation until 14 April 1937, and that payment was made to the Foundation on April 28, just after Duveen Brothers sold the painting to the Mellon Trust (copies in NGA curatorial files; Box 473, Folder 1, Duveen Brothers Records, accession number 960015, Research Library, The Getty Research Institute, Los Angeles). Duveen Brothers. Duveen Pictures in Public Collections of America. New York, 1941: no. 74, repro., as by Andrea Mantegna. Preliminary Catalogue of Paintings and Sculpture. National Gallery of Art, Washington, 1941: 121, no. 32, as by Andrea Mantegna. Book of Illustrations. National Gallery of Art, Washington, 1942: 239, repro. 144, as by Andrea Mantegna. Paintings and Sculpture from the Mellon Collection. National Gallery of Art, Washington, 1949 (reprinted 1953 and 1958): 25, repro., as by Andrea Mantegna. Summary Catalogue of European Paintings and Sculpture. National Gallery of Art, Washington, 1965: 82, as by Andrea Mantegna. European Paintings and Sculpture, Illustrations. National Gallery of Art, Washington, 1968: 73, repro., as by Andrea Mantegna. European Paintings: An Illustrated Summary Catalogue. National Gallery of Art, Washington, 1975: 212, repro., as by Andrea Mantegna. Shapley, Fern Rusk. Catalogue of the Italian Paintings. 2 vols. Washington, 1979: I:348, II:pl. 253. Walker, John. National Gallery of Art, Washington. Rev. ed. New York, 1984: 116, no. 95, color repro., as by Andrea Mantegna. European Paintings: An Illustrated Catalogue. National Gallery of Art, Washington, 1985: 298, repro. Echols, Robert. "Cima and the Theme of Saint Jerome in the Wilderness." Venezia Cinquecento IV, no. 8 (July-December 1994): 47-69, fig. 1. Boskovits, Miklós, and David Alan Brown, et al. Italian Paintings of the Fifteenth Century. The Systematic Catalogue of the National Gallery of Art. Washington, D.C., 2003: 444-447, color repro.